The redesigned Audi A6 is best experienced at speed, when the six-speed automatic transmission hits its overdrive stride and the car settles into the land of triple digits as comfortably as a Gulfstream IV corporate jet leveling off at its 40,000-foot cruising altitude. And while such Teutonic motoring may be felonious here in America, the great advantage of owning a machine with such deep reserves of capability is the ease with which it handles our much less demanding 65-75 mph highways. When you’ve got a package — brakes, suspension, steering, chassis — designed for routine cruising at speeds 20-40 mph faster than the fastest legal U.S. highway maximums, having to slow down quickly or make an abrupt maneuver hardly begins to test the equipment, let alone makes your pulse jump much when something unexpected happens. You just deal with it and motor on. Of course, competitor sport-touring sedans like the BMW 5-Series and the Mercedes E-Class are similarly Autobahn-friendly. 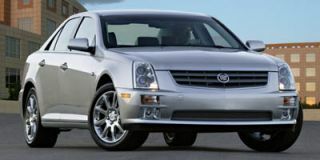 And they have a higher-profile as “prestige cars” than Audi, which many still think of as the German Buick — respectable but not quite in the same league as its high-line cousins. But the A6 has some new cards to play this go around. 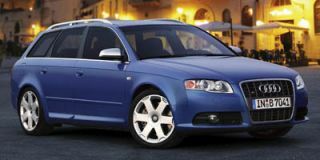 For starters, it comes standard with full-time quattro all-wheel drive. And it boasts a substantially more powerful standard engine — a 255-hp 3.2-liter V-6 — as well as a standard six-speed automatic, a longer-wheelbase chassis, and all the electronic bells and whistles to make it more than even-Steven with any car in its price range and then some. The current BMW 5-Series, for example, is a rear-drive-only deal: no AWD at any price. And its entry level price point of $41,300 for the 525i gets you a borderline economy car 184-hp 2.5-liter six-cylinder engine that’s a fulsome 71 hp less than the 255 hp that comes standard in the $40,900 A6. 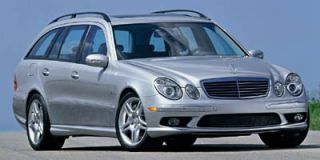 And while you can get AWD in a Mercedes E-Class, the base price of the 221-hp, V-6-equipped ’05 E320 4-Matic is a stupendous $51,000 — fully $10,000 more than the base price of the similarly sized, more powerful and AWD-equipped A6 3.2 quattro. You could step up to the V-8 powered A6 4.2 (MSRP: $50,500), get 335 hp to play with, and still have not passed the price point of the V-6 4Matic E-Class, a car with 100 less horsepower and a V-6 that would be no great shakes among cars in the $25k price range. Having an advantage under the hood is great for drivers who like things to happen quickly when they hit the gas. But it’s the added grip of the Audi’s Quattro drivetrain, which gives the A6 a leg up on its competitors, not just in inclement weather but also on your favorite winding country road, where its lateral grip is nothing short of tenacious. While you might miss being able to do a dragstrip-style burnout in an AWD-equipped sport-tourer like the A6, you won’t miss ending up in the ditch waiting for a tow truck. You’ll also no longer have to fear that first snowflake come winter, because the quattro-equipped A6 will go through stuff that would leave a rear-drive Bimmer or Benz spinning its rear wheels helplessly. In addition to its on-road wonderfulness, the new A6 is also a very pleasant place to spend a few hours. The longer wheelbase of the ’05 model allows for a roomier interior that’s noticeably more spacious than last year’s A6, especially for very tall/large drivers and passengers over six feet tall like me. A new Multi-Media Interface (MMI) with mouse-style inputs and a flat-screen monitor is sued to operate and control most of the vehicle’s secondary systems such as the audio, driver information computer, and optional DVD-based GPS system. It’s similar in concept to the COMAND systems used in several Mercedes-Benz models and the notorious BMW iDrive. But it’s easier to learn how to use — and to use by feel, without having to take your eyes off the road to puzzle over the buttons — than either COMAND or iDrive. And there are conventional rotary-style knobs for the climate control. The screen itself has an airplane-like display with cobalt blue or orange/red backlighting, and there are puddle lamps tucked under the front seats that cast a warm glow into the back seat footwells at night. All this fits in nicely with the theme of the car, modern and tasteful. Audi has consistently designed some of the nicest-looking, most coherent interiors in the luxury car class and the new A6 is no exception. However, those used to lavish displays of wood on the dash will have to recalibrate their Audi scales: this one’s atypically denuded of wood around the instruments, though you could build a mini-McMansion out of the panels on the console and doors. Much recommended if you live in a colder climate is the optional Cold Weather Package. For an extra $900 you get heated front and rear seats and headlight washers. 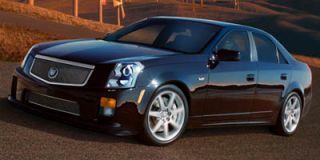 The $1250 Sport Package adds 18-inch rims and 40-series high-speed tires, along with a recalibrated, sport-tuned suspension. 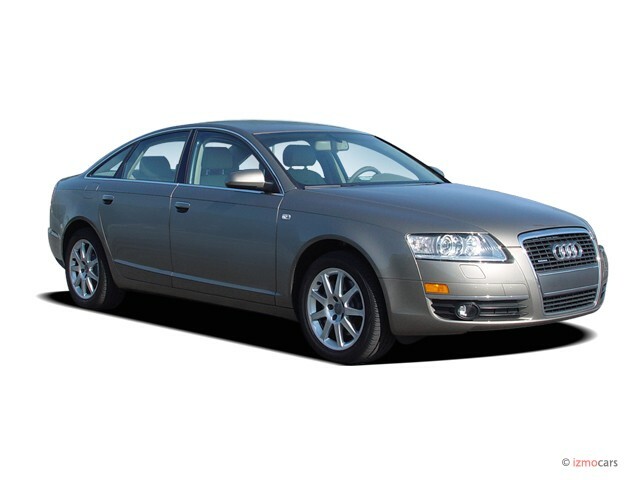 XM satellite radio, Parktronic sensors, a power rear window privacy screen/shade, tire-pressure monitoring system and keyless ignition system are other new for 2005 features that make the A6 — either the standard 3.2 version or the top-of-the-line 4.2 V-8 model — the equal of anything within financing range of $50,000. Mercedes may be able to justify its massively higher price point on the strength of the brand cachet of the three-pointed star. 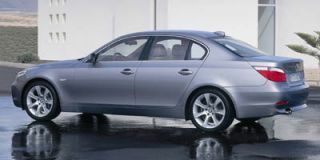 BMW still likes to trade on the sloganeering of “the ultimate driving machine.” But if objective considerations about features, capability, and performance matter to you at all, the ’05 A6 deserves your attention. Length x width x height: 193.5 x 71.3 x 57.5 in. Looking for a different year of the Audi A6?